The Fire Alarm Division services electronic equipment such as fire alarm systems, smoke alarms, and emergency lighting & exit lighting. The Sprinkler Division deals with water-based fire suppression such as sprinklers, standpipes, fire pumps, hydrants and cross connection controls. 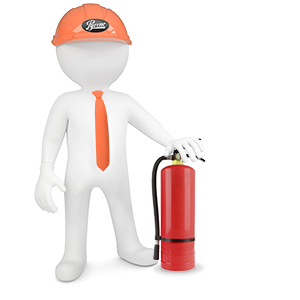 The Fire Extinguisher / Kitchen Fire Suppression Division focuses on chemical fire extinguishing equipment such as portable fire extinguishers, kitchen fire suppression systems and industrial fire suppression systems. Additionally, this division performs kitchen exhaust system inspection and cleaning. These diverse divisions, professionally managed and scheduled, allow Pyrene Fire Security Manitoba to offer complete service packages. Our divisions work together to achieve 100% code compliance for our clients. Due to the importance of fire equipment reliability and the associated liability, there is no room for the "jack of all trades, master of none" concept in this industry. Each of our divisions has technicians certified in their respective field of expertise. When we dispatch our technicians to perform a service, you can be assured they are certified for that specific task and type of equipment. Pyrene Fire Security Manitoba takes all the worry and hassle of multiple contractors away by offering all professional services in-house. With local ownership, clients can be assured of quality work at fair rates.